The English word ‘vintage’ was first used over five centuries ago, originally denoting wine harvest, in particular high quality wine produced in a good season. Today the definition of ‘vintage’ has broadened to describe anything that is dated but has a high quality. This expression has long been incorporated into the world of art and developed into a style of its own. New paintings and photos in vintage style have a sophisticated flavour of the past and can arouse nostalgic feelings. Traces of a former life and subtle brown and beige tones are typical characteristics of the vintage look. Have a look at KunstLoft’s new wall decorations in vintage style, or fall in love with a handmade oil painting which can make your living room or home staging appear even more appealing. Washed-out colours, weathered paint and small scratches – the vintage look can be applied on handcrafted sculptures and handmade acrylic paintings in many different ways. If you are certain that you do like artworks in this style but cannot decide on which piece from our KunstLoft collection, then we recommend you to find inspirations amongst our bestsellers. You certainly cannot go wrong with motifs and pieces that appeal to many people. A large format oil painting has the strongest impact on the viewer when placed in your spacious office, while motifs of cute animals in smaller canvasses for the children’s room can make your little ones’ eyes sparkle with joy. are especially suitable for your veterinary clinic or children’s room. Apart from realistic representations of animals we also offer paintings with freer artistic interpretations of the animal world. Our artists create truly unique pieces with distinct characters. 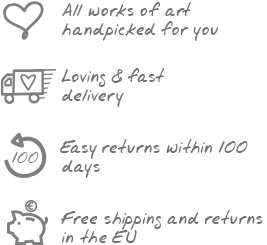 Show your affinity with authentic art and tailored design – your originality will shine through your choice of exclusive canvas paintings and sculptures from KunstLoft and your visitors will be greatly astonished! Indulge in nostalgia with exclusive paintings and vintage-style sculptures. While the sepia yellow of an old photograph stands out particularly well in the context of a modern living room, 3D Frame Art reinterprets the historical collage technique.